2013 was my fourth year to attend Camp Blogaway, the food blogger bootcamp held each year at Camp de Benneville Pines in the pine forested mountains in Angelus Oaks, California. Cabins, bunkbeds, sleeping bags, a lodge with a huge fireplace, and 100 food bloggers for a three day extravaganza saturated with food blogging happenings. This is what it is like in heaven. You can read two more of my posts about Camp from 2010 with many more photos here and here. 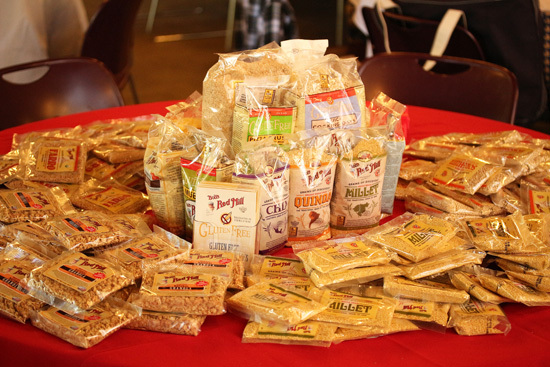 This year, one of the sponsors was Bob’s Red Mill, the specialty whole grains and flour company, and they gave out samples and coupons. I am now the proud owner of bags of Flageolet Beans, Corn Grits Polenta, White Rice Flour, Meusli, and Semolina Flour, and I have plans for every single one of them. 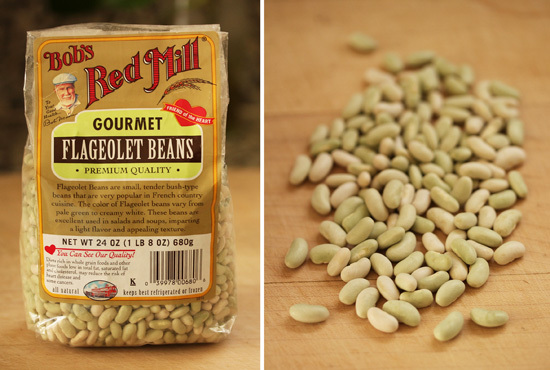 These Flageolet Beans are little creamy to light green colored bush beans that are popular in country French cooking. They are perfect in this Fageolet, Nectarine & Tomato Salad, because they soak up the juicy flavors of the fresh ginger, lime juice, orange zest and white balsamic vinegar. So every bite just pops with zing, and the great texture of the flageolets. 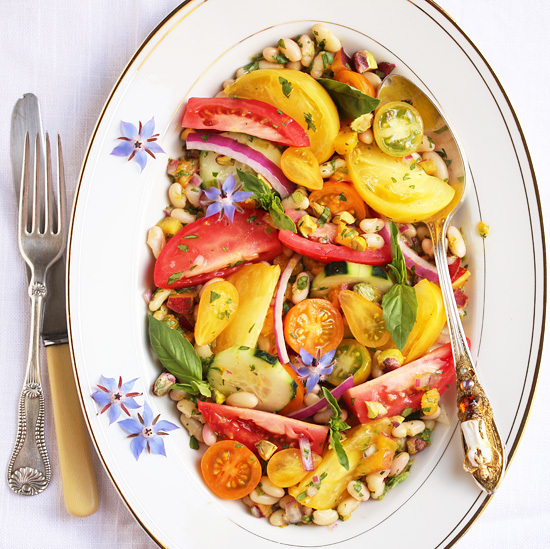 This would be a perfect salad to take on a picnic or to accompany your BBQ feast. Remember, Father’s Day is just around the corner. 1. On a serving platter, or on individual plates, place tomatoes, cucumber slices, nectarine pieces and red onion slices. Top with the flageolet mixture. Squeeze a good amount of lime juice over and drizzle with white balsamic vinegar. Sprinkle with basil and pistachios. Enjoy. 1. Mix together the vinaigrette ingredients. Fold in the cilantro, red onion, diced nectarine and flageolet beans. Allow to sit at room temperature for one hour, or cover and chill up to 24 hours. Note: The tomatoes and nectarine can be cut in wedges for a more dramatic presentation, but will need a knife and fork for eating. Oh my, that salad is a show stopper! The salad looks glorious! I have to make myself a large portion for the dinner too. Great seeing you at Camp B again (4 years for both of us! ), and your salad is magnificent, as usual. 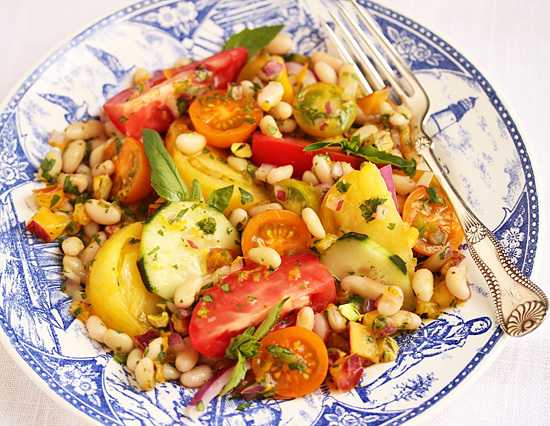 Wow, you know beans about beautiful salads! Yum! I had no cilantro on hand or jalepenos so substituted a bit of cumin (seems kind of Middle Eastern and some sweet yellow peppers. Not quite the same but really good.